Brita On Tap Faucet Water Filter System Filters cut the odor and impurities found in some tap waters to deliver great-tasting water. These filters are BPA-free and are designed to last for up to four months or 100 gallons. The handy filter indicator lets you know that the filter is working and reminds you when a filter needs replacement. One filter can replace up to 750 standard 16.9 oz plastic water bottles, reducing waste and cost. Reduce 99% lead, chlorine (taste and odor) and asbestos contaminants* and get great-tasting drinking water every time you turn on the faucet. Brita On Tap Faucet Water Filter Systems fit standard faucets only. These units do not fit pull-out or spray style faucets. Get great taste, less waste and more savings from Brita. EASY AND CONVENIENT: With Brita On Tap system, snap on a new filter in one easy step and get healthier, great-tasting water direct from the faucet. Brita faucet filters fit all models of Brita faucet filtration system. REDUCE CONTAMINANTS: BPA free filter filters out odors and impurities such as 99% lead, chlorine (taste and odor) and asbestos contaminants* that may be found in tap water. *Substances reduced may not be in all users' water. FILTER INDICATOR: A helpful status indicator on the system lets you know when your filter is working and when it needs to be replaced. REDUCE WASTE: One Brita water filter can provide up to 100 gallons of filtered tap water, replacing over 750 standard 16 oz. plastic water bottles. 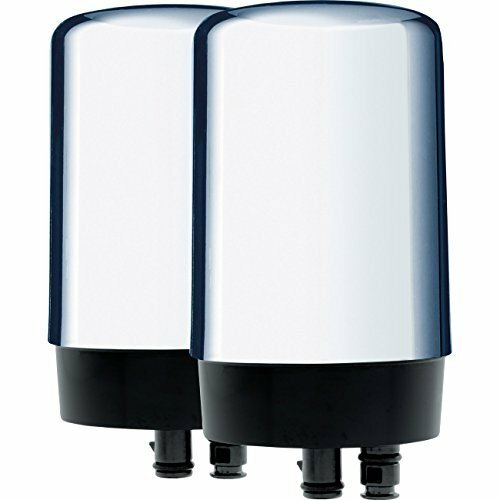 FITS STANDARD FAUCETS: Brita On Tap Faucet Filter Systems fit standard faucets only. They do not fit pull-out or spray style faucets.